There is a growing trend of investment in the African continent spurred by many diverse factors and players. The world’s rising demand for hydrocarbons and precious metals for high-tech devices means that the search for these resources will continue to penetrate regions that were under explored or cut off to the West and East due to import substitution policies of the latter part of the 20th century. In Africa, the relative stabilization of the political scene has meant that foreign companies are more likely to invest than before. The lack of ideologically polarized governments that had been prevalent in region during the Cold War also allows businesses to pursue market-driven objectives rather than kowtow to their national governments’ political orientation. The investors in the continent range from EU businesses seeking new markets now that the taint of colonialism has begun to wear off, to American energy companies seeking to diversify their holdings away from the politically and ideologically charged Middle East, to emerging countries seeking to find new markets for their growing industrial and services industries. Most notably, China has been the focus of much coverage of African investment. This trend has been reflected on by Africans who see in China a new south-south partnership that will reinvigorate African markets, as well as Western countries who see China as a new competitor for the consumption of resources. With this emphasis on China, many observers have failed to recognize the importance of the current hegemon in Africa: the Republic of South Africa. Though the Rainbow Nation may not possess the GDP or growth rates of China, or the other prominent emerging markets of Brazil, Russia, and India, the former apartheid state has significant trade links with the continent, especially in Southern Africa. This hegemonic status has been recognized by the other emerging nations by an invitation to South Africa to join their multilateral organization, BRIC (Brazil, Russia, India, China), in the spring of 2011. This move was questioned by the originator of the term BRIC, Jim O’Neill, who serves as chairman of Goldman Sachs Asset Management International, because of how small the South African economy measured compared to the original BRIC members. However, he said that South Africa as a representative for the African continent made much more sense because the scale of the continent’s economy compares favorably to Brazil and Russia (Hervieu). South Africa is positioning itself as the Gateway to Africa, a theme repeated by President Jacob Zuma, so that it may gain access to BRIC markets and BRIC investment. As an entrance to the potential one billion consumer base, South Africa would appear to be a able partner in enabling countries to set up a base of future expansion onto the continent. When this expansion occurs, the BRICS will find that in many of the nascent African economies South Africa is already the dominant player. To further examine South Africa’s relationship with Africa, this paper will set out to cover the size of South Africa’s involvement, in which sectors this involvement takes place, and why the BRICS are interested in the Republic. The formation of the BRICS singles an increasing interconnectedness between the Global South, namely a body that represents previously underdeveloped, colonized, and aid-dependent states. The ravages of globalization have been felt most acutely among these nations, but as the Global North recovers from the recent financial crisis, these nations are well-positioned to use their strengthened links to consolidate a place at the table of global power. Understanding the BRICS’s position in the world will lead to better analysis of what the new South-South alliance means for world geopolitics and trade. In the years following South Africa’s re-admittance to the world community with the end of minority rule in 1994, South Africa unleashed a wave of capital that had been pent up by apartheid and the resulting sanctions. This has led to a burgeoning economic relationship between the nations of Southern Africa and the Rainbow Nation. This relationship has grown to such an extent that the four largest emerging markets, Brazil, Russia, India, and China have extended membership to South Africa in order to capitalize on this economic relationship. The combined GDP of Africa is projected to rival the emerging economics of Russia and Brazil before the middle of the 21st Century (O’Neil). Thus the emerging economics of the world seek access to African markets in order to fuel their rise by buying primary resources and exporting manufactured goods. With South Africa in pole position to trade with Africa, many emerging economies see South Africa as the gateway to the African continent. To understand why South Africa is the dominant player in Africa, we must examine the years following 1994 when South African business unleashed it capital and manufacturing capacity on the lesser developed countries north of the Limpopo River. Following the African National Congress’s (ANC) victory in the 1994 national election in South Africa, many countries in the region believed that the era of South Africa’s belligerence towards the surrounding countries was at an end. This era had begun following the independence of the Portuguese colonies of Mozambique and Angola in 1976. The grouping of majority-r uled African countries became known as the Frontline States. They would serve as the primary benefactors of the ANC in exile during the liberation campaign. Training camps, headquarters, and diplomatic cooperation all served to strengthen the ties between the newly independent states and the ANC. However, this alliance was well noted by the minority government in Pretoria, the National Party. South Africa engaged in attacks against the Frontline States in economic and militarist form. South Africa had this power because it was the center of the Southern African economy due to the railroads constructed during colonialism that began at the Cape and spread north to the Witswatersrand, the Rhodesias, eventually to the Copperbelt in Zambia, and finally to what is now the Democratic Republic of Congo. All of the Frontline States were connected economically through these rail lines that shipped cargo to the main South African ports of Durban and Cape Town, thus South Africa could effectively put pressure on the Frontline States to not support the ANC. Most notably, South Africa achieved a strategic victory using this tactic with the signing of the Nkomati Accord in 1984 with the FRELIMO government of Mozambique. Both sides did not completely fulfill the agreement as outlined, which was that South Africa would stop supplying arms to the rebel movement in Mozambique, RENAMO, and FRELIMO would stop supporting the ANC. However, South Africa’s failure to comply was more significant as it led to the continued destabilization of Mozambique and finally forced FRELIMO to sign a peace accord in Rome in 1992 (Hentz 60). Other economic pressure included the severing of links with Zimbabwe, such as gas and rail lines. The National Party could also reduce the number of migrant workers that were admitted to South Africa to work on the mines, as this would cause the amount of remittances back to Frontline States to fall. Additionally, with the port links for the region based in the apartheid state, South Africa could delay customs payments to Frontline States, as well as reduce the use of their rail lines (the link to Maputo in Mozambique is shorter than the distance to Durban from the Rand), thus starving them of usage fees (Hentz 40). While economic integration strengthened following the removal of apartheid-era international sanctions, the 1990s were not the origin of regional integration. The oldest customs union in the world is found at the tip of the African continent, and originally contained South Africa and the three High Commission territories of former British protectorates of Lesotho, Swaziland, and Bostwana. The agreement between the four parties came into force just after the formation of the Union of South Africa, in 1910. The current agreement, the Southern African Customs Union, was implemented in 1969, and the fifth member of SACU, Namibia, joined after its independence from South Africa in 1990. The agreement sought to create a customs union, spur economic development of the union, and enable sharing of tariff profits equally between members (WTO 13). SACU is where South Africa has hegemonic powers, but since the ANC has taken power, South Africa has been more accommodating. A restructuring of the revenues was undertaken and has been given greater impetus as South Africa has negotiated bilateral agreements with the European Union and the United States which increase benefits for the Republic, but now force SACU goods to compete with imports from the US and the EU. Some see this new model of relations in SACU as a model for reforming South Africa’s imperialist relationship with the whole of Africa (Alden and Le Lepere, 152). Alden and Le LePere show that SACU is where South Africa’s hegemony has manifested most prominently. They compare this with the Southern African Development Community (SADC), where South African hegemony is currently being contested. SADC is the successor organization to the Southern African Development Coordination Conference (SADCC), which was an organization of Frontline States that formed to coordinate strategies to lessen the dependence on Apartheid South Africa for their economic survival. SADC was born in Windhoek, Namibia in 1992 in order to integrate the rest of Southern Africa following Namibian independence and also to reward South Africa after the National Party lifted the ban on the ANC and worked towards elections (SADC). The subsequent integration process primarily surrounded addressing the inequalities of the community due to South Africa’s dominance, specifically the fact that 80% of the GDP of SADC is produced by the Rainbow Nation. South Africa quickly became the largest investor in the region, with investments reaching US$5.4 billion in the year 2000. These included deals by major South African companies such as South African Airways, Eskom Enterprises, Sun International, Vodacom, and Sasol (Alden and Le Lepere, 130) Mozambique in particular has become a hotspot of South African business activity with 49% of South African FDI between 1997 and 2002 directed towards their eastern neighbor (Alden and Le Lepere, 134). Despite South Africa’s dominance in SADC, the Republic has shown high levels of reciprocity in dealings with other SADC members, mostly because of their history of destabilization in the region. However, the region is still susceptible to domestic policy shifts by the regional power. Most notably, tariffs on textiles from Zimbabwe were increased to 75% in the early 1990s to maintain support by the Congress of South African Trade Unions, a member of the tripartite alliance that governs South Africa. These tariffs have since come down to earlier levels, however COSATU wants the country to include a social clause that covers the rights of workers inserted in any bilateral or multilateral trade agreement (Alden and Le Pere 162). Added to this is the unfulfilled promises of social upliftment that many South African still seek from their government. Thus while South Africa seeks to be a benevolent partner in SADC, the size of the South African economy involved in trade means that its domestic policy will continue to affect the region as a consequence. Currently, South Africa’s investment on the continent is vast. From agriculture and mining, to banking and financial services, to retail merchandising, to telecommunications, the movement of capital from South Africa has impacted a diverse amount of African businesses. South African companies can access financing from South African banks and have experience in working with different cultures because of the diverse population of South Africa (Rundell). This trend began in period after 1994 when South African businesses were facing a saturated domestic market, presenting low or stagnant profit margins, but had large amounts of capital to invest. After the barriers to investment came down in the early 1990s, businesses moved quickly with encouragement from the government to take advantage of the market opportunities on the continent. This opportunity presented itself at a time when most nations in this post-Cold War era were either uninterested or intent on divesting from the continent (Southall & Melber 139-140). Additionally, neo-liberal policies were being imposed by major donors on countries that had fallen into debt because of import substitution policies. This created the opportunity to expand north into the continent because of deregulated markets that were privatizing state owned assets, while at the same time African governments were encouraging foreign direct investments and were willing to offer flexible labor regulations, as well as overall increased market access for foreign investors (Daniel, Lutchman & Naidu). In 2009 John Daniel and Nompumelelo Bhengu calculated South Africa’s trade relationship with Africa. Even with updated data their findings still have merit. For an overview of the continent, a review of Africa Report’s 2010 table of African businesses shows that 17 of the top 20 African companies by size were South African. 67 of the top 100 were South African and 32% of the top 500 originated from the Republic. The next biggest concentration of companies is Morocco with 16%. As many North African companies dominate the table, if only Sub-Saharan countries are included in the table, South Africa has 55% of the remaining companies in the table. China has been rising steadily on the continent in terms of investment and exports, but when it comes to South Africa’s backyard, China is still second in exports to SADC, with South Africa maintaining a solid advantage since 2001 (see chart 1). India is the other BRICS country that is expanding significantly into Africa. Of late, one of the most publicized forays was the attempted purchase of MTN SA by the Indian company Bharti Airtel, and the potential merger with Reliance Communications (Lakshman). Despite continued interest from these two BRICS partners, it is South Africa’s financial services and retail sectors that are continuing to make forays north into the continent. The development of trade between Nigeria and South Africa aligns the continent’s largest and most sophisticated services provider with the continent’s largest population. For years the difficult business climate, notably corruption, has stymied foreign firms from entering the Nigerian market (Southall & Melber). Also, foreign companies have to “assimilate or die” because of the high levels of patriotism found in the Nigerian consumer (The Economist). Both Vodacom and South African Airways have failed to make successful first ventures into the market. However, Mobile Telephone Networks (MTN) have had success upon entering Nigeria in 2001 and have led the charge for other South African companies to reengage Nigerian consumers. This led to a doubling of South African firms working in Nigeria between 2003 and 2007, with fast food restaurants (Nandos), wholesalers (Game), and retailers (Shoprite Checkers) seeing success (Southall and Melber). As the middle class in Nigeria grows, more premium brands are sure to enter as seen by Protea Hotels growing its chain from 4 hotels in 2007 to 11 currently (Protea Hotels). This serves as another indicator as Protea Hotels are notable for serving the South African business class, thus an increase in hotels shows not just a catering to middle class Nigerians, but also reveals an increase of interest from South African business men and women in the country. South Africa’s traditional titans on industry, Anglo American Corp, Anglogold Ashanti and Kumba Resources have spread their capital around the continent as the resource boom has caused prices to skyrocket on world markets. Thus South African engagement with resource rich countries such as Angola, Democratic Republic of Congo, and Zimbabwe has increased as gold, oil, and precious metal prices increase on the world market. More than a third of Anglogold’s non-South African gold production is in Africa, specifically in Mali, Ghana, Guinea, and Tanzania (Varner). The financial sector has capitalized on this demand and South African banks have lent to foreign governments to finance projects as well. As telecommunications stands to play an critical part in economic growth and development on the continent, the companies that enter the market while still embryonic stand to gain increased returns when the market grows due to an expanding economy. One of the companies that has entered many of these nascent markets in Africa is MTN Group, a South African telecommunications company that was incorporated in 1994 originally as M-Cell. 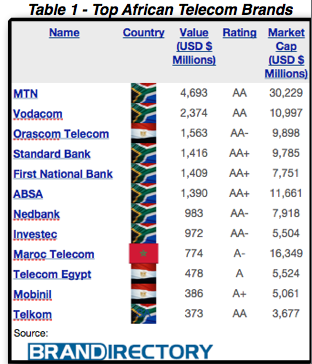 M-Cell held 25% of MTN Holdings, a group that had been awarded the first two mobile licenses in South Africa and 60% of M-Tel, a service provider. By 2000 M-Cell had acquired 100% of both and adopted its current name of MTN Group in 2002. In contrast to Telkom SA and Vodacom, MTN is a product of the new South Africa having formed only after majority rule had come to the country. By 1997 the company had expanded into the north with the snapping up of licenses in Uganda, Rwanda and Swaziland. 2001 saw the company move into the lucrative but very difficult to enter Nigerian market (Cairns). Success in Nigeria saw MTN hit 10 million subscribers in 2004, but expansion into the rest of the continent as well as the Middle East means that by December of 2010 their subscriber base had grown to 141.6 million subscribers, meaning a growth rate of 1300 percent over six years (MTN & Larbie). This growth has been not just a quantitative success, as in March 2011, MTN was ranked the top African brand by BrandFinance Global 500 (See table 1). Further growth can be expected as 19 of MTN’s 21 covered countries have high opportunities for further mobile penetration (See chart 2). While mobile will continue to be an important part of MTN’s business, they have made a much publicized investment in the West African Cable System (WACS), a broadband submarine cable that will greatly increase the available bandwidth to connected countries. MTN made a buy of US$90 million in the US$650 million project making it the largest investor. This will allow MTN to receive a capacity of 11% of the 5.12 Tbs cable. The cable connects Africa to Europe, with Portugal being the originator in Europe continuing down to connect most of West Africa, then following the coastline south, to the DRC, Angola, Namibia, and finally ending in South Africa. MTN has also invested in the other submarine cables including US$50 million in the Europe India Gateway, US$40 million in the Eastern African Submarine Cable System (EASSy) and US$10 million in the SAT-3/SAFE, a connection between Portugal and Spain to South Africa (Larbie). With broadband appearing to the be next frontier of ICT investment in Africa, MTN’s funding and share of the future broadband connections to the continent bode well for the South African mobile company’s long term prospects. South Africa’s representation as a good neighbor is aided by MTN’s success as there is no stain of apartheid compliance in its business history. As MTN’s international profile through acquisitions and high profits increases, South Africa’s business profile is improved as a by product. Originally a grouping of states used by Goldman Sachs, the four countries grouped in the acronym, Brazil, Russia, India, and China held their first summit in Russia during the summer of 2009. This signaled the formalization of the body into a multi-lateral organization that has since sought to be the representative for emerging markets in the traditional western oriented world bodies such as the G20 and UN Security Council. Also at the 2009 summit, the heads of state of BRIC countries called for emerging economies to have a greater voice in international financial institutions and to diversify the worldwide monetary system (Seria). In 2010, South Africa sought to join the BRIC organization in an effort to spur growth and increase greater connection by lobbying to include the African continent in the organization. Jacob Zuma visited each of the BRIC countries in 2010 seeking to convince the countries that South Africa’s membership would legitimize the BRIC formation. South Africa made the case that the BRIC would remain a Goldman Sachs configuration until the countries acted on their own to decide on membership. South Africa also saw an opportunity to further their economic integration on the continent through partnerships with BRIC companies and financial institutions. While making the pitch that South Africa was representing the continent, government officials were also positioning the country to be the first destination for foreign capital that would be able to fund further ventures by South African companies onto the continent. With South Africa’s growth rate of 3% much lower than the other countries, there appears to be a mismatch between the new entrant and the other four countries. South Africa hopes to use this to its advantage by positioning itself as a pool for BRIC investment in South Africa’s advanced economy, plus a base for further investment by the BRICS in the African continent. The Republic also has institutional stability, historically strong financial markets, and effective regulators that is looked on favorably by foreign investors, especially those looking to start pan-African operations (Hervieu). As reviewed above, South African business in Africa is widespread and the weight of traditional powers such as Sasol, SABMiller, Telkom, and Anglo American mean that on a corporate level South Africa can match its BRICS partners (Bauer). These companies hope to capitalize on the stated goal of the BRICS to increase inter-group trade to US400 billion by 2015. The access to BRICS consumers, who make up nearly 40% of the world population is another advantage for South Africa (SA Info). The BRICS involvement in Africa recently gives a clear understanding of the increased interest on the continent and why South Africa can be seen as a leader of investment in the region. For China, foreign direct investment in Africa is expected to cross the US$100 billion mark in 2011 (Cossou). This dwarfs South Africa’s US$12 billion in 2010. 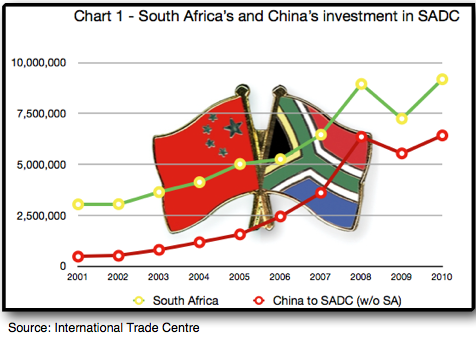 However, when we examined this in South Africa’s backyard, SADC, we saw China is still playing for second place (see chart 1). Additionally, when we control for BRIC trade to South Africa, only China has a significant size of exports to the Africa continent, which is to be expected based on their massive economy. India is the other major player, with their amount of exports to Africa rising in the middle of the last decade to a level where they now rival South Africa’s exports (see chart 3). Finally, looking at trade from the African continent’s perspective, the amount of African exports to the BRIC countries (excluding South Africa) ave grown at a rate of 5700% compared to growth of African imports to the G7 countries, which grew at only 170% . Even the 2009 financial crisis shows resilience in the relationship between Africa and the BRIC countries as the growth fell at a much lower rate that exports to the G7 (See chart 4). This should further illuminate the BRICS importance to emerging markets as not only do they call for greater trade equality, they also have burgeoning middle classes that need resources from other emerging economies, thus fueling growth in both. South African investment in the continent is often overlooked by the media because of former neglect of interest and the current fascination with the Chinese flexing their power on the continent. However, as this paper has shown, South Africa has become an economic hegemon in Sub Saharan Africa now that the chains of apartheid have been stripped away. Through government encouragement to use their large sums of idling capital, South African businesses set off to buy, merge, and invest in the African continent that had shunned the Republic for most of the 20th century. In telecommunications, MTN has led the charge onto a continent that is desperate to be connected to the rest of the world for business, culture, and education needs. Not only has MTN bought into emerging mobile markets, but they have seen the next frontier of ICT development in Africa. By funding broadband submarine cable projects, MTN will be part of the expansion of broadband services to the continent and will continue to represent the South African brand in more sectors. Jacob Zuma’s diplomatic success on gaining admittance for his country to the BRICS has garnered praise, though not from his domestic constituents because of ongoing infighting among the ANC and their tripartite alliance partners, COSATU, and the South African Communist Party. With Zuma on the ropes for reelection, his personal membership as a BRICS head of state may be short lived, but his legacy will no doubt be improved if South Africa is able to take advantage of increased access to capital and markets. While analysts and scholars will be monitoring the BRICS impact, the success of South Africa still remains tied to the African market. It may be a naive strategy to believe that BRICS countries will only invest in South Africa, rather than turning into competitors on the continent. By that same measure, African growth will undoubtedly benefit South Africa, thus as other economies rise, so with South Africa’s. The Republic currently enjoys a status among its African trade partners that will likely be forever changed by the entrance of Brazil, Russia, and India to their economies. South Africa will lose an amount of power over their trading partners if African states have an alternative to the South African market to sell their goods to. Thus admittance to the BRICS undoubtedly serves the other members of the organization, and opens opportunities to the African continent, but will membership ultimately prove successful for South Africa? Only further research in the coming years will tell what the economic and political benefits or perils will befall the Rainbow Nation. Until that time, South Africa will bask in the increased spotlight obtained through union in the fledging alliance of emerging markets.